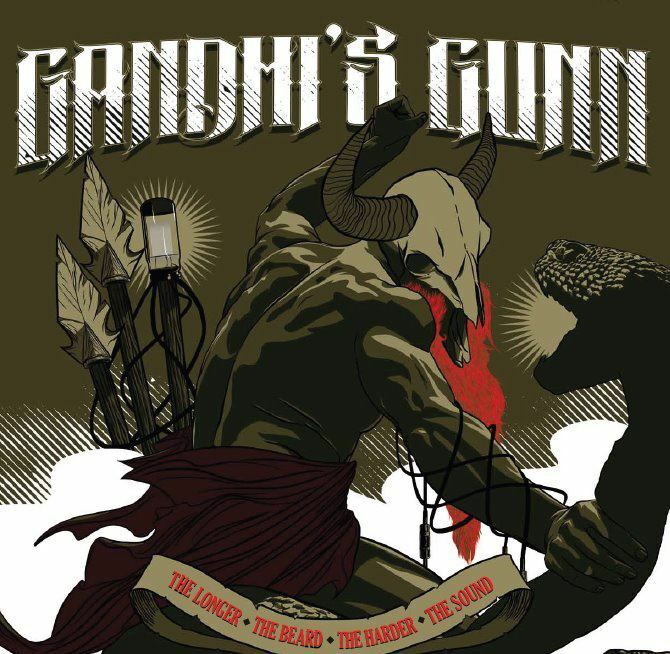 Heavy Planet : Album Review: Gandhi's Gunn - "The Longer the Beard the Harder the Sound"
Album Review: Gandhi's Gunn - "The Longer the Beard the Harder the Sound"
Gandhi’s Gunn is certainly the real deal. They are four Italian musicians that know how to bring it stoner style - soaked in diesel fuel, burning slowly, hotly, efficiently, with the constant deep rumbling rhythm of powerful, muscular instruments driving forward, onward, in an onrush of music and might. Gandhi’s Gunn certainly bring the juice a second time on their full length LP, “The Longer the Beard the Harder the Sound”, following on the heels of their highly acclaimed first album “Thirtyeahs”, which itself was nothing short of a stoner rock revelation, setting the foursome up with the mammoth millstone of a task to, if not top the sound of their first album, to at least match it in some way. “The Longer the Beard the Harder the Sound” reveals and displays many strengths possessed by this stoner foursome that lend themselves readily and perfectly to a compilation bursting at the seams with delicious, toothsome tracks that are immediately recognizable as noteworthy and memorable, not only as stoner rock renditions, but as fine examples of great and prodigious rock n’ roll. Among the strong qualities of the band is a penchant for song writing, for structuring a song that is as enjoyable to play as it is to hear, filled with ear catching melodies, strong, rhythmic vocals, interspersed with guitar riffs, hooks, and solos that are truly the icing on the proverbial cake. They lay down such well crafted songs that you find it hard to point out a single track that is a favorite over another. In addition to the tremendous song writing ability are the strong, dynamic instruments that create an atmosphere that pulls deeply at your imagination, immersing you into an abyss of sound where distortion and low tones surround your senses, obliterating the light of reality, and rendering upon your consciousness an enjoyment that seems to emanate from your heart while instantly connected through your aural canal, pulsating in time, radiating outward to a cervical genuflection of hair whipping frenzy, and downward to a metatarsal melee of piston pounding pleasure. The opening onslaught of stoner rock comes in the form of "Haywire", full of frenzy and wonderfully warped guitars driven inexorably forward by deep and powerful vocals, providing four full minutes of sweat inducing energy. The guitar work displayed initially on the second track, "Under Siege" is both unusual and inspiring, experimental and playful in rendering a fun and unusual intro before launching into a full out stoner blitz of hard punching drums, heavy, muscular bass, and fuzz to the max guitar wrapped around full, throaty vocals of power and sinew. The intro on "Breaking Balance" is the bass this time around, playfully setting up a stage of guitar sliding and bending perversion that seamlessly transitions into a classic stoner sound of deep, sinewy guitars, grinding and driving throughout a full and rich vocalization of melodic might, punctuated with a short but clear guitar solo. "Flood" is a change of pace, demonstrating Gandhi's Gunn's willingness to play what they like and what sounds good to them, even if it is a departure from the norm of full and heavy instrumentation. Here we are treated to a single guitar and vocal refrain of simplicity that is powerful in its starkness before accompaniment kicks in with the slow measured additions of drums and bass, complementing the smoky, smoldering vocalization that serves as the focal point, punctuated by a louder, more forceful hook, giving way to guitar virtuosity that plays out for a pleasurable and lengthy conclusion. A funkier rendition is executed on "Red (The Colour of God)", where the guitars play back and forth from low and fuzzy to high and playful, with an equally funky drum beat punching its way throughout, accentuated by a playful and funky bass delivery. "Rest of the Sun" is a classic stoner track, playing out in a measured rhythm of down tuned and distorted guitars, peppered throughout with quick, staccato solos. This song is the epitome of classic stoner rock but with Gandhi's Gunn's unique take and superb delivery. "Adrift" begins with a fun, unique guitar rendition and song structure that permeates throughout the refrain, leading into a chorus of similar structure and sound, pounding along in a slow, almost imperceptible rise toward a final delivery that is only briefly accented with an equally unique solo. The closer is "Hypothesis", a 10 minute trippy, hippy trip of psychedelic overtones and nuances that floats along on a magic carpet of sound and wonderment, interspersing sitar-like guitar work with a fast, fun, staccato drumbeat and chanting vocalizations lending to the trippy atmosphere before merging into the signature sound of hard, heavy, muscular fuzz and distortion that floats along on the hippy winds of sound, gaining slight momentum that brings the song into a crescendo of dreamlike distortion. Gandhi's Gunn have a quality and a knack for making music that full and rich, enjoyable and memorable, and resplendent with the best of what stoner rock offers us in a thoroughly enjoyable rock sound that is equalled by no other. "The Longer the Beard the Harder the Sound" is full of quality stoner rock music and is a worthy addition to any stoner rock collection, or, for that matter, any rock n' roll collection, regardless of genre.